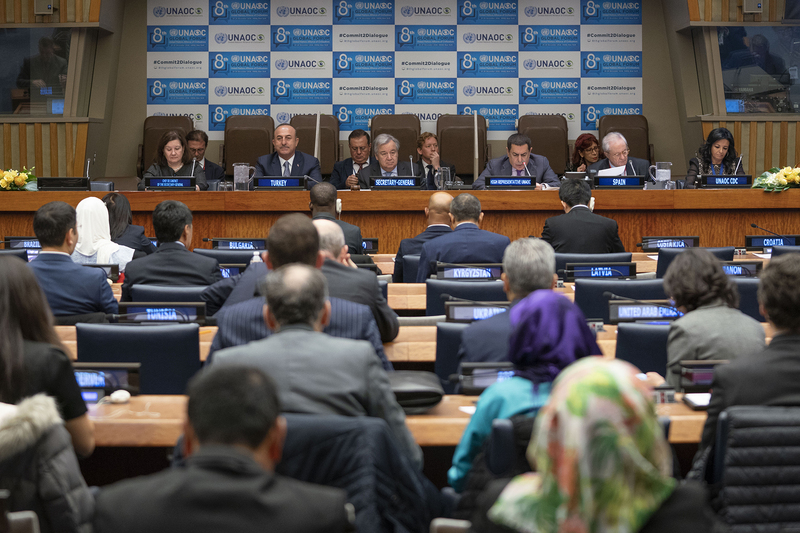 The co-sponsors of the United Nations Alliance of Civilizations (UNAOC), the Governments of Spain and Turkey, together with the State of Qatar, opened the 8th UNAOC Global Forum in New York on 19 November 2018 at the United Nations Headquarters in New York. H.E. Mr. Nassir Abdulaziz Al-Nasser, UNAOC High Representative, kicked off the Opening Ceremony recalling the genesis of UNAOC and the essential roles played by both the Governments of Spain and Turkey and the late Secretary-General H.E. Mr. Kofi Annan. H.E. Mr. António Guterres, United Nations Secretary-General, decried the rise of extremism targeting the “other,” stressed the role of youth in peacebuilding, and emphasized the relevance and importance of UNAOC programmes and activities. The President of the 73rd session of the United Nations General Assembly, H.E. Mrs. María Fernanda Espinosa Garcés pointed to the consonance between the priorities of her office and UNAOC activities, while H.E. Mr. Fernando Martín Valenzuela Marzo, State Secretary for Foreign Affairs of Spain, and H.E. Mr. Mevlüt Çavuşoğlu, Minister of Foreign Affairs of Turkey, reaffirmed their support for the work of UNAOC. At the end of the Opening Ceremony, keynote speaker H.E. Mr. Sultan bin Saad Al-Muraikhi, Minister of State for Foreign Affairs of Qatar, pointed to the concrete support offered by Qatar in the work of UNAOC, including the fourth UNAOC Global Forum in Doha in 2011, and the 8th Global Forum in New York.